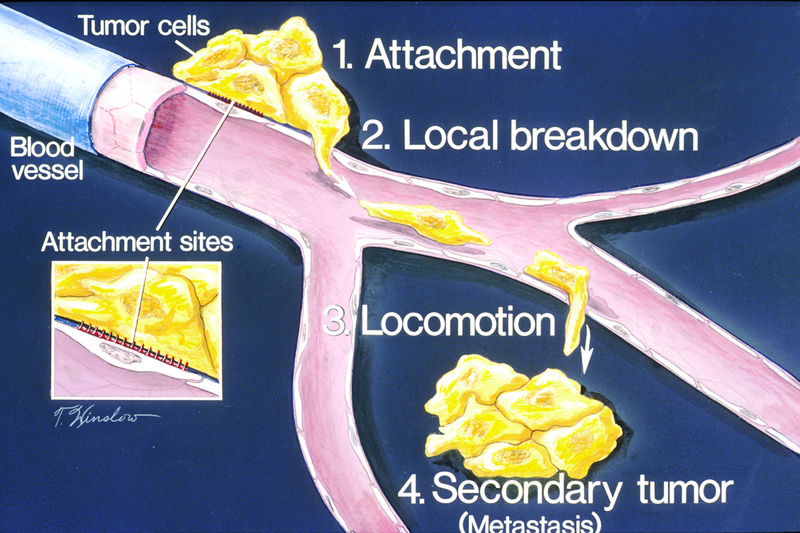 On Friday, I introduced you guys to the importance of motility in cancer metastasis. However, motility isn’t the whole story, another important factor is the type of respiration (energy generation) that the cell uses. As I gathered from conversations with Jacob Scott (and please correct me if I am wrong), when a tumor saturates the area it is in too quickly to recruit new blood vessels then the cancer cells can become oxygen deprived and be forced to switch from the full aerobic Kreb cycle to a focus on less efficient but anaerobic glycolysis. This shift is known as the Warburg effect and is used for diagnosis and monitoring of cancer progress. For an evolutionary game theorist, this means that when we study metastasis we need to consider three strategies: autonomous growth (AG; called ‘proliferative’ in the previous post), invasive (INV; called ‘motile’ in the previous post), and glycolytic (GLY; new to this this post). As I am starting to write this post, the last of the 4th of July fireworks are winding down outside. I am currently traveling through New York on my way to Swarmfest 2013 in Orlando, FL and to visit David Basanta and Jacob Scott at the Integrated Mathematical Oncology Department of Moffitt Cancer Research Institute in Tampa, FL. The weather is unbearably hot already, so I imagine I will struggle in Florida, especially since I forgot all my shorts in Montreal! The more important struggle, however, will be my lack of background in biology and medicine. On Jake’s suggestion, I decided to look at a paper of David’s on an evolutionary game theoretic approach to the emergence of motility in cancer cells. As far as I understand, one of the key steps in going from a benign tumor to a malignant cancer is metastasis or the ability of a cancer to spread from one organ to another non-adjacent organ. To achieve this, a cancer cell has to transition from a simple proliferative cell to a motile one. However, motility usually involves a cost to the organism. Programming playground: Cells as (quantum) computers? Nearly a year ago, the previous post in this series introduced a way for programmers to play around with biology: a model that simulated the dynamics of a whole cell at unprecedented levels of details. But what if you want to play with the real thing? Can you program a living cell? Can you compute with molecular biology? Could this single-celled photosynthetic algae be your next computer? Biology inspired computation can probably be traced back as far back as Turing’s (1948) introduction of B-Type neural networks. However, the molecular biology approach is much more recent with Adleman (1994) proposing DNA computing, and Păun (2000) introducing membrane computing with P-systems. These models caused a stir when they appeared due to the ease of misrepresenting their computational power. If you allow the cells or membranes to carry on exponential rate of reproduction for an arbitrarily long time, then these systems can solve NP-complete problems quickly. In fact, it is not hard to show that this model would allow you to solve PSPACE-complete problems. Of course, in any reasonable setting, your cells can only grow at an exponential rate until they reach the carrying capacity of the environment you are growing them in. If you take this into account then efficient DNA and membrane computing are no more powerful than the usual definition of efficient computation — polynomial time on a Turing machine. The stirred (i.e. inviscid) nature of membrane and (early approaches to) DNA computing provide substantial constraints for empirical realizations, and scalability of bio-computing. In these early models, regulatory molecules are reused in the self-mixing environment of the cell, and gates correspond to chemical reactions. As such, gates are temporary; and the information carrying molecule must change at every step of the computation to avoid being confused with residue from the previous step. This made implementing some gates such as XNOR — output 1 only if both inputs are the same — experimentally impossible (Tamsir, 2011): how would you tell which input is which and how would the gate know it has received both inputs and not just an abnormally high concentration of the first? Taking inspiration from biology is not restricted to classical computation. Vlatko Vedral provides a great summary of bio-inspired quantum computing; start from top down, figure out how biology uses quantum effects at room temperature and try to harness them for computation. The first step here, is to find a non-trivial example of quantum effects in use by a biological system. Conveniently, Engel et al. (2007) showed that photosynthesis provides such an example. It is cool to know that we can observe a quantum walk, but can that be useful for computation? My former supervisor Andrew Childs (2009; see also Childs et al., 2013) is noted for showing that if we have control over the Hamiltonian defining our quantum walk then we can use the walk to do universal computation. Controlling the Hamiltonian generating a quantum walk is analogous to designing a graph for a classical walk. Theoretical work is still needed to bridge Rebentrost et al. and Childs, since (as Joe Fitzsimons pointed out on G+) the biological quantum walk is not coherent, and the decoherence that is present might doom any attempt at universal computation. The last ingredient that is needed is a classic controller. Since the graph we need will depend on the specific problem instance we are trying to solve, we will need a classical computer to control the construction of the graph. This is where I hope synthetic biology results like Bonnet et al. (2013) will be useful. The transcriptors could be used as the classic control with which a problem instance is translated into a specific structure of chlorophyll molecules on which a quantum walk is carried out to do the hard part of the computation. The weak quantum signal from this walk can then be measured by the transcriptor-based controller and amplified into a signal that the experimenter can observe on the level of the behavior (say fluorescence) of the cell. Of course, this requires a ridiculous amount of both fundamental work on quantum computing, and bio-engineering. However, could the future of scalable quantum computers be in the noisy world of biology, instead of the sterility of superconductors, photon benches, or ion-traps? Adleman, L. M. (1994). Molecular computation of solutions to combinatorial problems. Science, 266(5187), 1021-1023. Engel GS, Calhoun TR, Read EL, Ahn TK, Mancal T, Cheng YC et al. (2007). Evidence for wavelike energy transfer through quantum coherence in photosynthetic systems. Nature 446 (7137): 782–6. Păun, G. (2000). Computing with membranes. Journal of Computer and System Sciences, 61(1), 108-143. Tamsir, A., Tabor, J. J., & Voigt, C. A. (2011). Robust multicellular computing using genetically encoded NOR gates and chemical/wires/’. Nature, 469(7329), 212-215. Last Wednesday, October 10th, 2012 we discussed Roca, Cuesta & Sanchez (2009) Evolutionary games theory: Temporal and spatial effects beyond replicator dynamics. The hope was to have a review as amazing as Szabo & Fath (2007), and we divided the work in a similar way. Thomas Shultz presented Section 2: Basic concepts and results of evolutionary game theory. Marcel Montrey presented Section 4: Structured populations. I covered section 3 (The effects of different time scales) but without slides; I am still a fan of the blackboard. Tom’s slides provide an exposition of the basic model of the replicator equation, and closely follow Nowak’s Evolutionary Dynamics. I recommend these slides if you need a quick reminder. Unfortunately, the rest of the paper did not build on the equation (as you would expect from title) but provided (mostly) simulation based alternatives. Section 3 discussed the observation that having a different number of interactions per generation sets the speed of evolution. Evolution is fast is there are few interactions per generation, and slow otherwise. Fast evolution leads to more noise in the population, making it harder to stay in shallow optima. Unfortunately, they do not present cases where this results in a change of optima, like the low pairings we saw in Riolo, Cohen & Axelrod (2001). In his slides, Marcel does a great job of stressing the key insight RCS09 provide in section 4: the importance of update rules. The authors focus exclusively on simulation work, and point out the inconsistencies that can arise from seemingly minor changes in update rules. For the rest of the discussion of spatial structure, they do not go beyond Szabo & Fath and Marcel’s spatial structure post. In all honesty, I was expecting a more analytic treatment from this Physics of Life Review, and was disappointed about the disconnect from the greatest strength of replicator dynamics: the intuitiveness of an analytic toolkit.